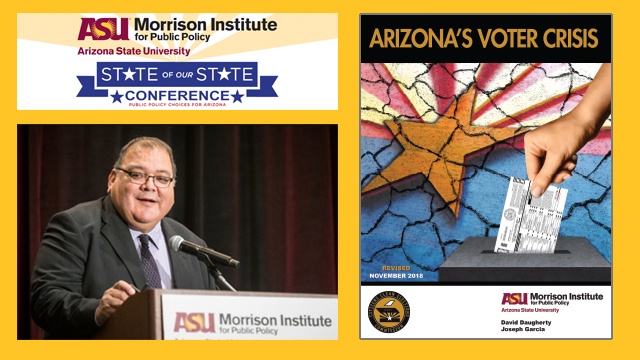 At this week's State of Our State Conference, Morrison Institute's annual signature event, the updated report on "Arizona's Voter Crisis" was distributed and findings were presented. You can find a PDF version to download HERE. October 2018 saw record rainfall in Arizona, yet this week marked the 484th week of drought for our state. In other words, just as one good rainfall doesn't end a drought, one good mid-term turnout doesn't end Arizona's voter crisis. That isn't to say there isn't cause for celebration. A midterm turnout of better than 63 percent among registered voters is the result of many hard-working individual and group efforts to get out the vote. But celebration should not lead to complacency any more than it should conflate into confidence that this midterm somehow signifies a permanent change in the voter climate. Not to pop anyone's balloon, but if history of Arizona voter turnout shows us anything, it's that every midterm takes on a life of its own. A healthy midterm for voter participation doesn't guarantee voter vitality going forward. Every harvest is different and last year's crop means little to next season's seeds. For example, Arizona's record 65.12 percent turnout in midterm 1982 fell back to 55.68 percent in the following midterm, 1986. There was no consistent growth. The 60.47 percent midterm turnout in 2006 was followed by a 55.65 percent yield in midterm 2010. What will midterm 2022 look like? Can we build on the momentum? Midterms are the most difficult elections to predict, given their wide swing in recent years - from 45.82 percent in 1998, to a near-record 65.12 percent in midterm 2018. Sometimes a big midterm portends a big presidential election cycle two years later, and sometimes not. We'll see in the 2020 election whether the "blue wave" has crested. In this case, hindsight will be 2020, at least for a single election cycle, until the next midterm. But really, what's particularly troublesome about getting giddy over Arizona's "historic mid-term" is our fixation on the 2.4 million voter turnout among registered voters. That's a big number. However, lack of participation by potential and eligible voters - those U.S. citizens age 18 or older - is more than that total, even though they are essential to our representative de-mocracy. These nonvoters are often young (this mean you, millennials) and poor, perhaps never having finished high school nor going to college, and likely people of color (especially Latino). There are many reasons why people don't vote, as the report points out. Regardless, it is estimated that less than half (48 percent) of otherwise eligible voters (both registered and non-registered) cast a ballot in Arizona's 2018 midterm election. National voter turnout figures are similar. So, is having less than half of citizens exercising their right to vote a reason to celebrate? Or, in a representative democracy, is it reason to be concerned? When do we sound the alarm for Arizona's voter crisis as we did for the opioid crisis? Is it when non-participation hits 55 percent or 60 percent? Maybe 65 percent or even 70 percent? Pick a number, because we are a state and nation divided in half - between those who vote and are a part of our democratic government, and those who don't and aren't. As a society, we cannot operate at full potential when we're only at half capacity, any more than if half of our workforce failed to show up tomorrow … and the next day, and the day after that for the fore-seeable future. I often say, "Voters don't determine elections, nonvoters do." Until that statement cannot be reasonably argued because voter participation overwhelmingly says otherwise, Arizona's voter crisis continues and, I'm sorry to say, despite the record October rains, so does the drought.